Having spent most of the night playing a copy of the 1994 game "Theme Park" that I downloaded yesterday (reliving my childhood years...), I decided to visit ICANHASCHEEZBURGER to look at some amusing images before I retired. Having now seen so many lolcats that I am no longer amused that greatly by the concept, I decided to follow a link to one of their partner sites, and see what that did for me. 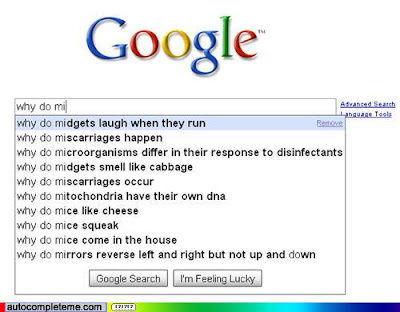 The site I wound up on is called "Autocomplete Me", and shows some of the funny search results that come up when you type certain phrases into google. Looking at these, I was not only entertained, but also learned some very informative information (EDIT: you can tell I'm tired, I'm proof-reading right now, and I just thought "informative information. WHAT?". Which is why, for your reading pleasure, I am leaving it in). For example: I thought I was the only person who said "Damn you, Salazaar!" when my laptop goes wrong - turns out there's 77,000 search reslts for 'Damn you Salazaar' if you type it into google - that's gotta be on a par with "All your base are belong to us"! 2nd EDIT: Then again, it's "Smells Like Teen Spirit", so Kurt would probably be glad someone was ruining it - man, he hated that song. 2. I was listening to a ridiculously depressing song by Nirvana at the time, and when I realised that, whilst listening to an incredibly dark song about mental illness and depression by a guy who shot himself, I was laughing - the thought of this made me laugh even harder, and then I couldn't stop for about half a minute straight. p.s. saw Kurt and Courtney earlier (whilst we're on Nirvana) so I might review that soon, also watched the movie "Street Kings" with Hugh Laurie (as in Hugh Laurie was in the film, I didn't watch it with him - oh, and I just saw Stephen Fry do an Epic Hugh Laurie burn on QI last night), so you can expect a review of that one too - probably tomorrow (haven't stated yet). So, until then - keeping those Midgets laughing! 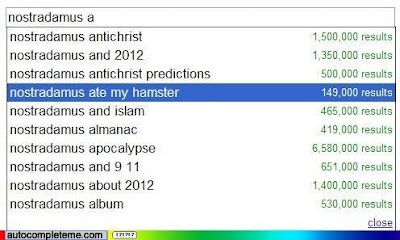 Why are people searching for these things?